A lot of people always ask about a healthy snack or dessert to satisfy a sweet tooth. I for one am a huge fan of sweets and desserts, especially anything with chocolate and peanut butter, but I try to refrain from eating them often because of their high fat and sugar content. 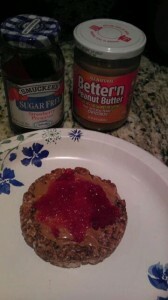 My love for this delicious combo though had me first on the hunt for the perfect peanut butter. There is a lot of controversy on peanut butter. In a nutshell, it is more then 50% fat with 20% of the fat in peanut butter being the unhealthy kind. However, the rest of the fat is “healthy fat” (mono and poly – unsaturated fat), which is known to lower cholesterol levels. Other pros to peanut butter is that it is high in fiber and has a lot of protein (7 grams per serving). At the end of the day, I have a hard time smearing 16 grams of fat and 190 calories (for two tablespoons) on anything. As I began my hunt for the perfect peanut butter I realized there are a lot of different options. Many brands now make theirs with Omega 3’s added in and other heart healthy ingredients. Some are even reduced fat, but still have 12 grams of fat, 190 calories (110 fat calories) per two tablespoons. Even these were a bit too high for me on the fat and calorie intake scale. My quest finally ended at Super Target where I found Better’n Peanut Butter. It has 85% less fat and 40% fewer calories then regular peanut butter with only 100 calories and 2.0grams of fat for two tablespoons. The flavor and texture is just like those with a higher fat content. I am in love! You can check out Better’n Peanut Butter for more information. I am a peanut butter fanatic, I won’t lie. I have never heard of this stuff, but it seems like a good investment, I ordered some this morning! Not sure it sells in stores in Canada, so ordering seemed the way to do it.